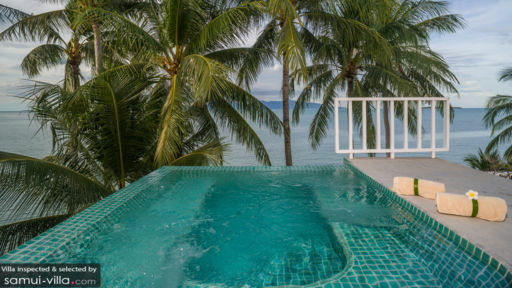 Villa M Samui – originally called Villa Macpherson – is a three-level, beachfront vacation residence that epitomizes period architecture and classic elegance. With a consistent white color scheme, interiors are furnished with classic, complementary pieces and adorned with a carefully chosen fixtures from all around Southeast Asia along with first-rate comforts for your all-out convenience and enjoyment. 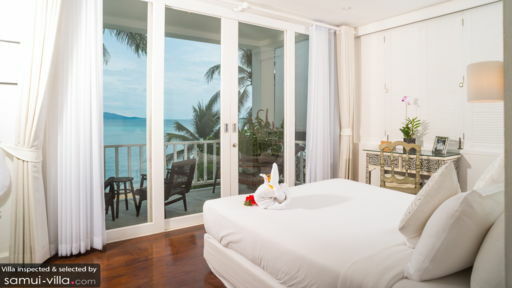 Truly, Villa M Samui affords you aristocratic vacation living with a highly aspirational, coastal ambience. Air-conditioned bedrooms – five all in all – are on the villa’s three levels – one is on the ground level, three are on the second level and one more is on the topmost level. All bedrooms have dedicated bathrooms as well as balconies. But only the bedroom on the third level opens out to another spacious balcony adjoining the jacuzzi and which looks out to the gulf. Bordering the villa’s beach side is the swimming pool with a covered wooden deck where you can laze for some sun. On the villa’s roof top is a jacuzzi with 360-degree views of the landscape and the Gulf Of Siam. The villa has two airy living areas – one is on the ground level common space and the other is on one corner of the second level. The dining area is behind one of the ground level, living area couches and the fully-equipped, modern kitchen is perpendicular to the dinner table. The amiable staff of the villa can anticipate your demands as well as arrange services that will definitely amuse you. 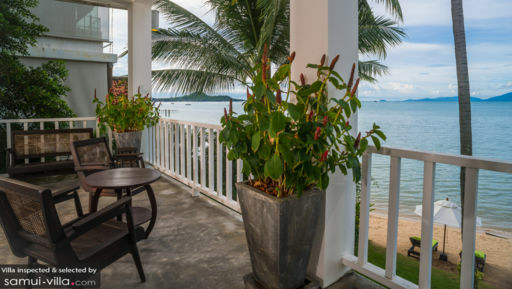 Villa M Samui is based along Bo Phut Beach where you can commune with the water – all day long. As you comb the two-kilometer beach, you will eventually arrive at a village with both Asian and European old-world architecture and where a street market comes alive every Wednesday. On your next day tour, you can check out Buddha monuments, animal farms as well as embark on more active endeavors.